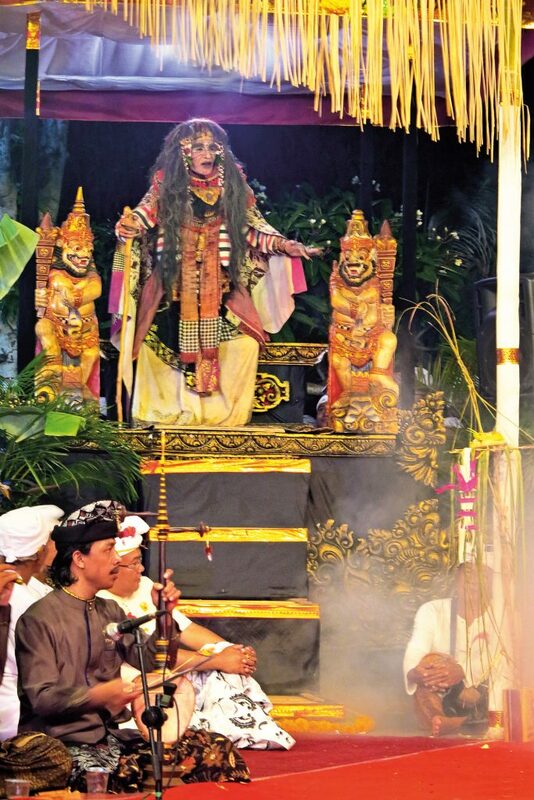 Last month I let loose my handsome protégé Mustakim of Malang (East Java) on a string of Calonarang performances in exotic temples, to test his mettle (mettle-testing is my forte). He performed with flying colours. 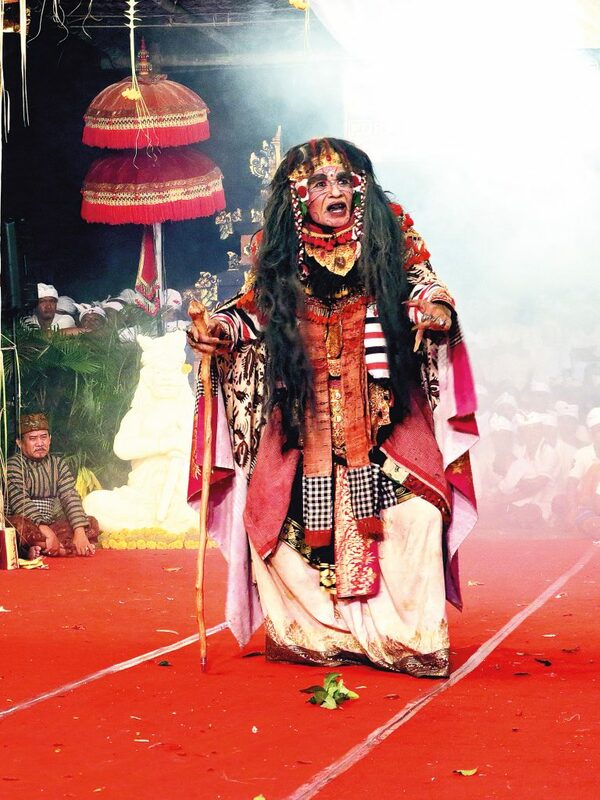 Calonarang are the popular spooky witch-dance dramas that that are held sporadically in Balinese village squares. 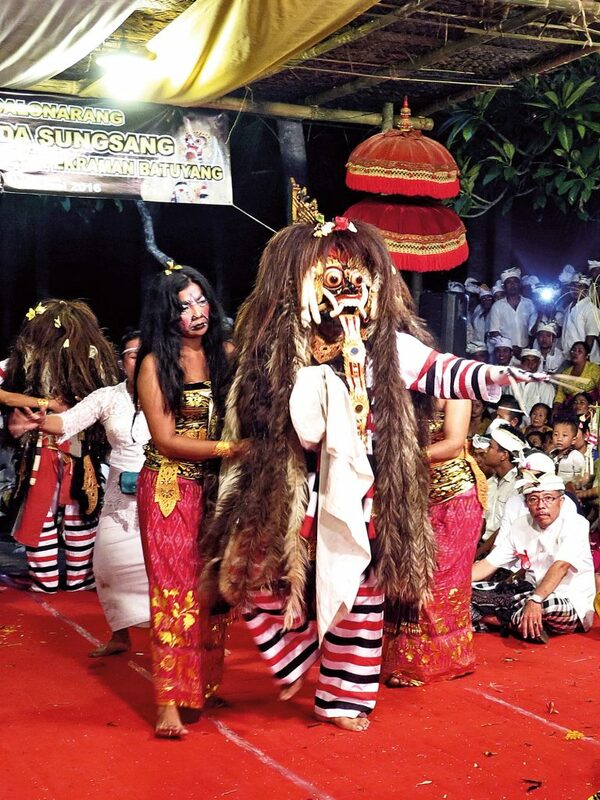 They involve teams of dancers — playing, variously, witch novices (sisia), demon dancers (celuluk), witch queens (rangda) the mighty barong Banaspati Raja, a ton of musicians, stage hands, patih (trance/kris dancers) and, of course, one corpse. These days it is a pretend corpse, an actor, but in days of old, in the Basur version of the Calonarang, real corpses were hurled around. So please, readers, be careful to tip your therapist at the spa. 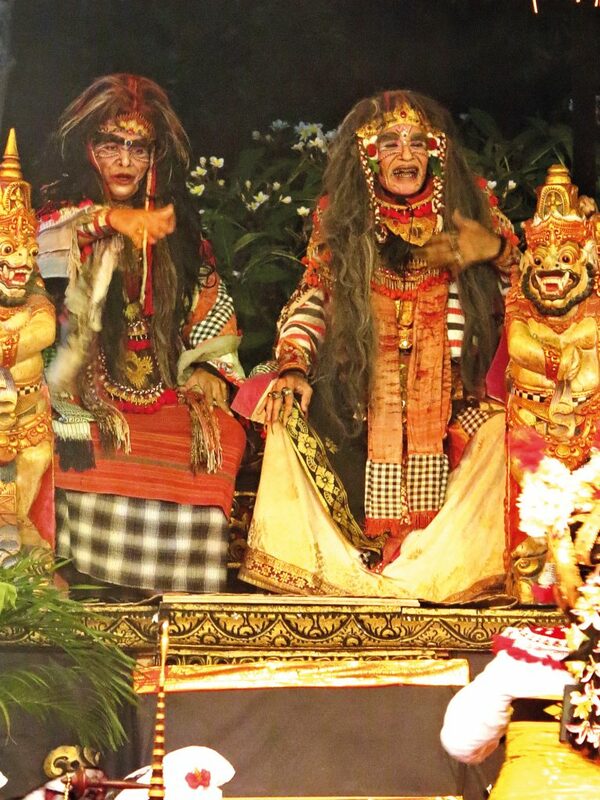 Last month I let loose my handsome protégé Mustakim of Malang (East Java) on a string of Calonarang performances in exotic temples, to test his mettle (mettle-testing is my forte). He performed with flying colours. 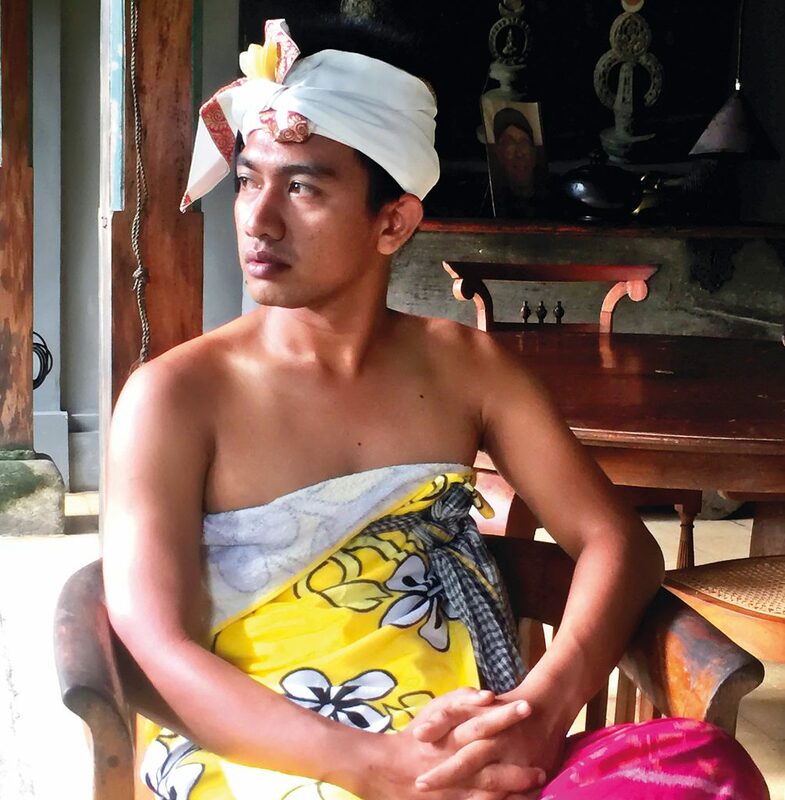 A Muslim youth with a passion for the old East Javanese Hindu Majapahit culture, he threw himself into the fray without a moment’s hesitation. Remarkable the self-confidence really, considering he’s only been understudying me for three months. See his video on the Calonarang at Pura Dalem Batuyang and Pura Majapahit Monang-Maning, Denpasar. On Facebook many seasoned Calonarang dancers have used his photos as cover pics. The temple aunties across the land are lining up for the Mustakim Ace Narsis (Narcisist) temple detective treatment. One day, at the end of a really ceremonial week. I sent him to Tenganan village to shoot the famed Perang Pandan (Pandanus leaf fighting), and he came back with 20 snaps of Tenganan cuties (see next page). Ha! The quiet Brahman compound, which I foisted myself upon in 1973 (pop. 7 people), has now become a baby factory (est. pop 70). 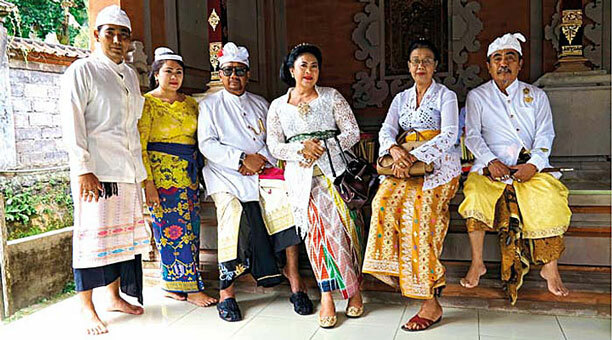 Today, a good sampling of my in-laws from Geria Sibang — a good Brahman house well north of Denpasar — has invaded the compound, together with their matriarch, the divine 93-year-old high priestess Ida Pedanda Istri Lingsir Sibang. When I arrive, late in the afternoon, to shoot the event, two of Pedanda Istris perfectly-formed great grandchildren are playing virtuoso gender (gamelan) like baby Mozarts. The ceremonies are in full swing. I notice that the baby’s spirit effigy (anak-anakan) — an amazing concoction of banana tree flower and woven coconut leaf titbits — has today grown a ghastly plastic pansy, some tinsel, and a string of fake diamonds. Now, I have been documenting Bali’s tragic slide into kitsch — the municipal beautification campaigns, the new heavy temple architecture, the Ice Capades wedding-dress fashion, to mention just a few examples — but this is the first time that I have seen Dolly Partonesque spirit effigies. Last month, I was attacked on Facebook by young progressives (palace fashionistas for the most part) after I commented, negatively, on over the top (OTT) trends at this year’s Arts Festival. Of course the Arts Festival can do no wrong — it is the ultimate celebration of Balinese culture, by the Balinese, for the Balinese — but this year, a lot of the parades and performances are celebrating kitsch. By the way of educating the masses I posted a few 1930s photographs of outrageous Busby Berkeley musical costumes. I pointed out during the 1930s — the heyday of OTT movie fashion — the women wore costumes, not the other way around. Scorn is poured upon me. I challenge them to a debate on ‘Bad Taste’ at the ISI Art Institute, but no-one accepts the challenge. I am, however, invited by a Denpasar university to lecture on aesthetics, and to present my coming book Busana Bali – Balinese fashion through the ages. Stay tuned. I digress. Today the atmosphere in the old home is heavenly: aunties sing lullabies as the baby is conveyed through a production line of rituals. Another Balinese baby is refined and ready to take on the jumbo-loads of tourists. Magnificent atmosphere here tonight at the end of the third day of the Odalan Nadi temple festival at Pura Pusering Jagat Dalem Sidakarya, an important state temple near Sanur. I arrive at 8 30 p.m. and find the barong already parked amidst a sea of white devotees in the outer courtyard. The famous Merta Jati gamelan is playing on one side of the open stage. The celestial nymph Telek dancers emerge (my old Bali Hyatt gardener Lanying was once leader of this pack). 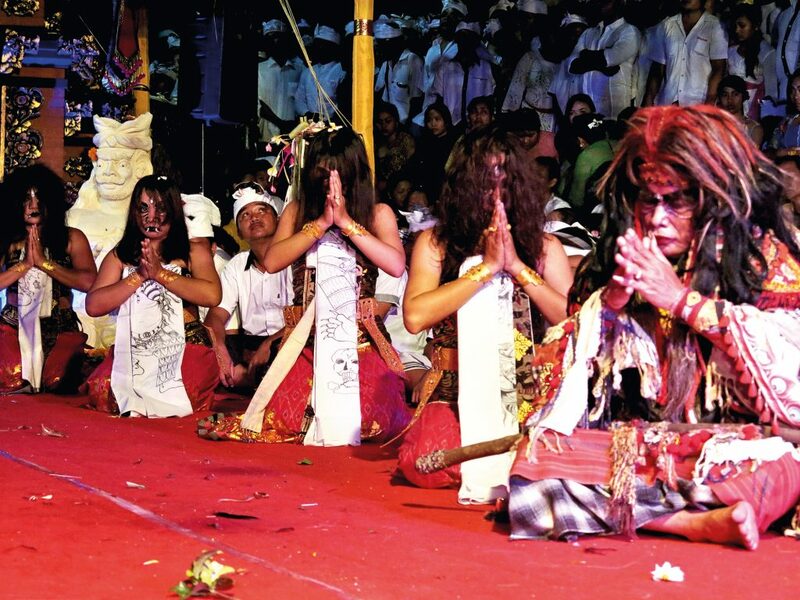 Instead of forming two lines and strutting their stuff — the heavenly and unique Telek dance — they start a girlish dance of welcome. Instead of tripping the heavy fantastic they are light in their loafers. I start protesting to the umbrella bearers, the gathered vigilantes, the village chief — anyone who’ll listen. Apparently Lanying has retired and a new Arts Festival enthusiast called Wayan Bancik (girly-boy) has taken over. Quelle domage, Doreen! After a few minutes pansy-posturing and waving fans, the eight Telek dancers move towards the parked but swaying Barong and suddenly go into a series of wild airborne trances. Bali is full of surprises (see Video: https://www.youtube.com/watch?v= XS4z5Gm9xfg). 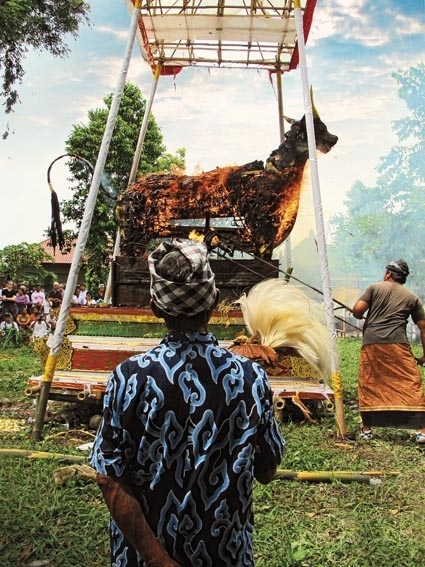 Bali Tourism at the Crossroads?